Home » Health A-Z » Obesity & High Blood Pressure: Here Is What You Need To Know! Obesity & High Blood Pressure: Here Is What You Need To Know! A young school teacher, 5’2 tall and weighing 92 kgs, had been battling with obesity since a long while now. One fine day, during her work hours, she felt a lump in her left arm. She had no control over her reflexes and the duster she held fell off from her hand, and she fainted. She was rushed to the hospital and timely treatment helped her recover soon. Reena was suffering from accelerated hypertension which in her case had remained undiagnosed. Cases like Reena’s are quite common, however, they are often left undetected. Several studies suggest a direct relationship between obesity and high blood pressure. As per statistics, 2 in 3 people with high blood pressure happen to be obese. With the increasing incidence of high blood pressure, it is also becoming prevalent in children. -Recent research validates the direct association of obesity, high blood pressure, bad lipids, and diabetes and they increase life threatening risks many folds. People with high blood pressure, need to be extra cautious with their dietary habits, daily routine and lifestyle habits. –Restrict your salt intake. A total of 5 grams of salt per day is considered enough. Do not add additional salt to your food. A more effective way of doing so is, stop placing the salt cellars on the dining table. –Monitor your weight, blood sugar levels, cholesterol levels on a regular basis. Make sure you consult your doctor with your reports. If you are on BP medication, make sure you check your BP at least 3 times a week. –Exercise regularly. You can choose to walk or take up a sport to keep yourself active. Regular exercise helps to keep the blood pressure under control and also helps to keep away those extra pounds. –Do not change or alter your BP medication (strength or frequency) on your own, or stop them, even if your BP reports are normal. Make sure you consult the specialist before doing it. It is the most common mistake that people commit and suffer later on. -In case you smoke, quit smoking. Volumes of literature suggest the direct relation of smoking with high blood pressure. –Practice meditation and yoga. It helps to relax and calm you. It will keep you physically active and also calm your senses. In severe cases, if nothing else helps as well as these lifestyle modifications, you can opt for Bariatric and metabolic surgery. Just like it helped Reena get back to her day-to-day schedule (weighs 68 kgs and is doing well without any medication), it could serve as a boon for you as well. Dr. Atul N. C. Peters joined Fortis Hospital, Shalimar Bagh in July 2012 and established the Institute of Bariatric & Metabolic Surgery as the Director & Head. At present, he is associated with Fortis Hospital in Delhi (across four locations in India) and Dubai (Medeor Hospital, Zulekha Hospital, and Tonic Surgery Dubai). With over 18 years of surgical experience, his practice is now dedicated to Bariatric & Metabolic Surgery for diabetes, performing more than 300 cases annually. Dr. Peters has been accredited the “Surgeon Of Excellence” by Surgical Review Corporation. 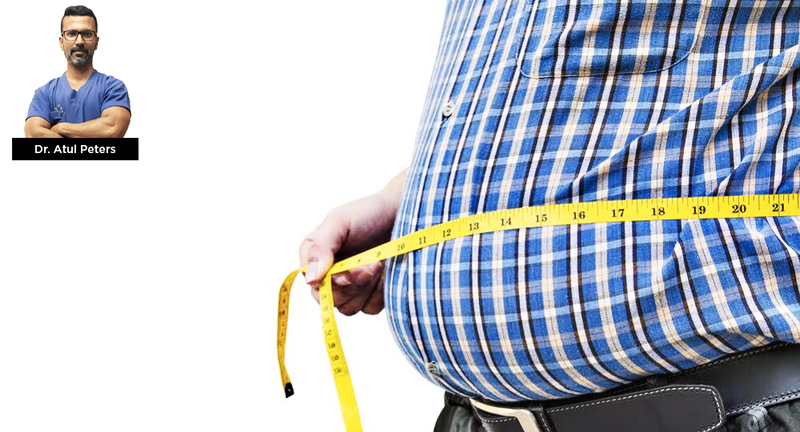 5 Common Causes Of Obesity You Should Be Aware Of! ← Did You Know These 5 Habits Are Harming Your Kidneys?